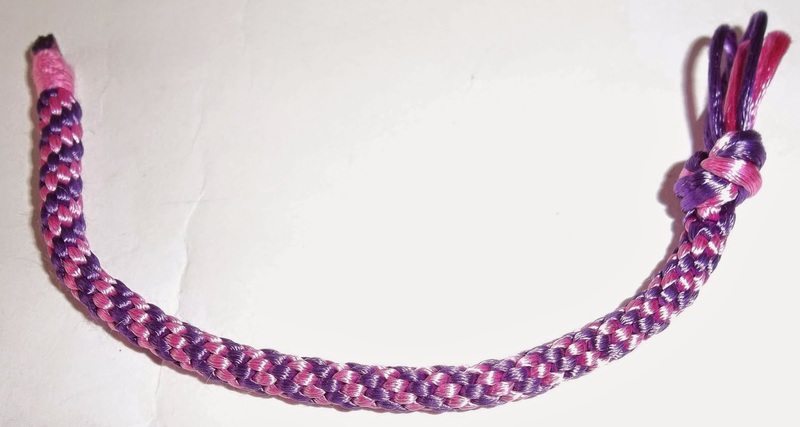 This pink and purple satin cord braid was my first attempt and I was really delighted with how it took shape. It is a meditative process - top right to bottom right, bottom left to top left and turn - but this is only the beginning and there is a lot more that can be made. I used organza ribbon for the blue braid, but it wasn't as smooth a finish as the satin cord and was a bit scratchy. However, it was a good experiment. 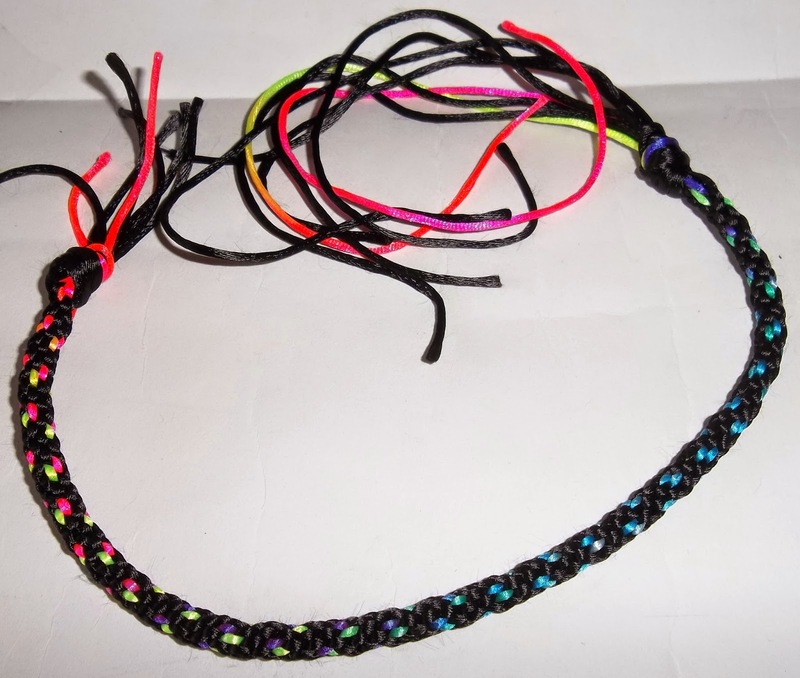 This one used rainbow satin cord with black and worked really well. However, as you can see, none of these have been made into jewellery. This is because I am considering how to finish a braid off. 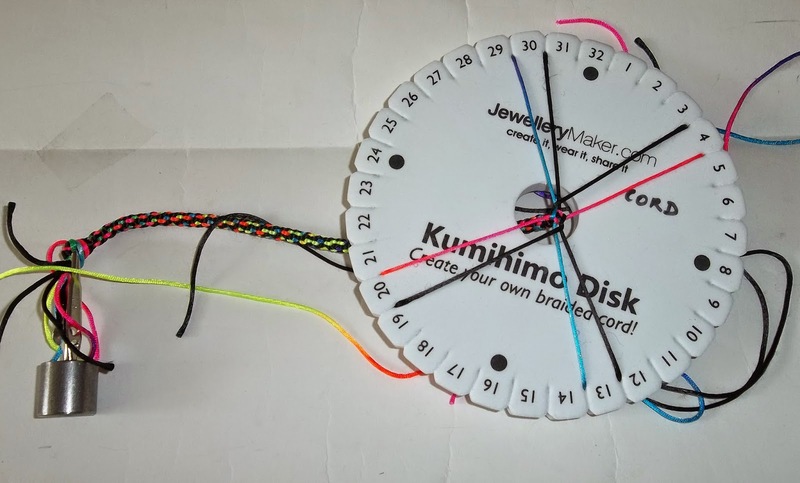 You can buy kumihimo ends, you can make your own using wire, you can use ribbon cord ends... A bit of experimentation and practise may be in order. Of course, apart from all the patterns you can create using different colours, different numbers of cords and different disks, there is the excitement of being able to braid beads and gemstones into the braid as you go. Now that is something I definitely would like to try! Thanks, Ma Reyes. I enjoy learning new skills which can be used in jewellery making. Oh wow. When I enlarged the photos the details were amazing. I am really looking forward to seeing how you develop and use this new skill. Thanks, EC. I will have to work on how to best finish the braids off and then I would like to try braiding the beads in, although that is perhaps running before I can walk! I am looking forward to experimenting! Best wishes and have a good rest of the week. That looks like fun. Some time ago I watched a woman at a re-enactment day doing a similar thing with a stiff card, she said that it predated even mediaeval times. Thanks, Toffeeapple. I can totally believe that, as I think the Japanese have used this craft to create braids since about 550 CE (according to one website). It is a lovely thing to do and the repetition is very relaxing. Although as yet, I have only just touched the surface, I am looking forward to trying lots more. These look great, I can't wait to see what you do with them and adding in gem stones sounds fabulous! Thanks, Josie. I am still pondering the finishing off, but once I have tried a couple of options, I'll post some photos. I am really looking forward to being able to add in gemstones too and I have been adding some 4mm ones to my stash in readiness! Oh dear, another new hobby ;-)... Just joking, it looks terrific! So nice to learn new things, isn't it? Thanks, Mirjam. I know, I just can't help myself! Although it does come under the hobby of 'jewellery making', so isn't really another hobby. Well, that's what I'm telling myself, anyway! I enjoy learning new skills and am going to have a go at a sixteen thread braid next, I think.